With Wilson’s The Raven That Refused to Sing released in February 2013, everybody went all crazy hailing this record as the best release to be released in the year. It was that golden rule that proved right once again – rushing into things is not wise. 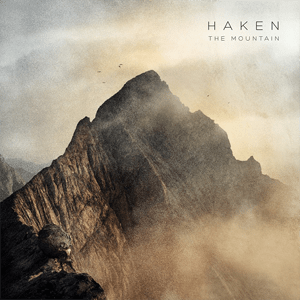 Some seven months later, a progressive rock sextet from london Haken released their third studio record named The Mountain. Quite amusing, the title of the album came as both a joke and no laughing matter, as it seems to be topping absolutely everything that comes on the crowded main route. The band’s Falling Back to Earth song from the mentioned album has been voted as the best prog epic of 2013 in our poll, indicating that their fanbase is growing enormously. They are also one of the top 5 in our readers poll for the best progressive album of 2013 (closes on January 10th). With all this in the air, I talked with the band (yes, all of ‘em puppets minus ex-bassist Thomas MacLean), making it their third interview on our very website. How do you manage to create all these complex tracks, but still keep them entertaining? Especially on The Mountain, the entertainment factor is more emphasized than it’s case with previous two records. Richard: Thanks, that’s great to know! We’ve grown up listening to bands like Queen and Gentle Giant, so we’re very much of the school of thought that entertainment is paramount. To keep the listener engaged, we try to provide a delicate balance of drama, dynamics, moods, colours, complexity and simplicity within each track. I always like to think of the technical parts as a seasoning or spice, which essentially enhances the overall recipe of each song. It is important for us not to be complex for complex sake; otherwise we would end up with something too cold and calculated. How long did it take you this time to complete the creating process of the record? Knowing that you guys are writing music that you enjoy to play, how much are you picky when it comes to the final structures of songs? Richard: We all listen to a broad range of music, so it can sometimes be tricky arriving at something we’re all fully content with. However, for me, this is part of the fun of being in a band! A lot of thought goes into each track before it arrives at it’s final mastered form. I initially spend a year or so composing the songs. We then shake up the arrangements in the rehearsal room for a few months before twisting each track even further by recording a demo. The last stage in the process is the final recording. Richard handles the core writing in the band, but it’s the rehearsal room where the songs take its shape. What is your method of songwriting? Charlie: That’s right, Rich plays both guitar and keys, which perhaps gives him a unique perspective in the band and means he can compose these pieces with an overview of what he thinks everyone should do. Typically he’ll email us all a midi file of a band arrangement. This is the starting point that we take into the rehearsal room and play the song live, play around with the parts, change things, add sections, edit sections and essentially kick the song around until we all think it’s finished. The production on The Mountain is quite different, I’d say a lot more modern comparing with “Aquarius” and “Visions”, what’s pretty interesting considering the fact that the album is inspired by the 1970′s progressive rock to some extent. What is your take on it? Diego: Having Jens Bogren as the mixing and mastering engineer was a big part of The Mountain’s sound. He did an amazing job behind the mixing desk and somehow understood straight away what we were aiming for in terms of aural character and quality. However, when we started the recordings we didn’t set any boundaries for how we wanted the album to sound. As you mentioned: The Mountain was tangibly influenced by 70′s music, at the same time we threw in some prog-unrelated influences like: Ambient, Soul, Jazz, 80′s synth pop, minimalism or even those Glitch-Hop Drums on Because It’s There. On Visions, the verses and choruses on the first half of the title track were among the first lyrics written for the album and the story evolved from there as the music was written, whereas Aquarius was pretty much mapped out before any music was written. How did it go with The Mountain? Ray: The Mountain set out on a few different lyrical paths before realising its final form. We initially had a couple of quasi-concept ideas but soon began to realise this was a bit too constrictive so we pretty much chose a song or two each. At this stage the music was still in the creative stages so each of us chose the song(s) that spoke most personally to us. We then tried to reflect that music with our words and vice versa. It soon became clear that this was a great collaborative decision as we all began to really dig what each one of us came up with and we were able to help one another with any musical/lyrical guidance they might have needed. It was a truly collaborative process. Aquarius garnered critical acclaim and rapidly grow legions of fans throughout the world, and then with Visions you managed to evolve further, bringing more fans. Did you feel any kind of pressure knowing that your third album should be something really exceptional and top the previous two albums? Ray: I can’t remember feeling any pressure as such. At the end of the day, we’re making the music that we love to make so we can only be proud of ourselves for getting anyone else to like it in the first place. Aquarius was a great start and we really were stunned by the overriding positive response it received. Visions took it to a new level as you’ve said. But actually, on the whole, Visions was almost a formulaic progression rather than a revolutionary risk. With The Mountain, I think we were all on the same wavelength with pushing our potential and not settling into a comfortable routine of music making. It was clear some risks had to be taken, regardless of the outcome. And thankfully, with a room full of six extremely fussy musicians, we wouldn’t let anything slip! On top of all that, we had the backing of Inside Out, who we’d just signed with, so we were really keen to show them what we could do and we were confident we’d at least please some of our fans! One of the things that keeps impressing me about Haken is the way you transform from a classic progressive rock to a modern progressive metal act in your songs. How do you do it? Charlie: Thanks, that’s good to hear. 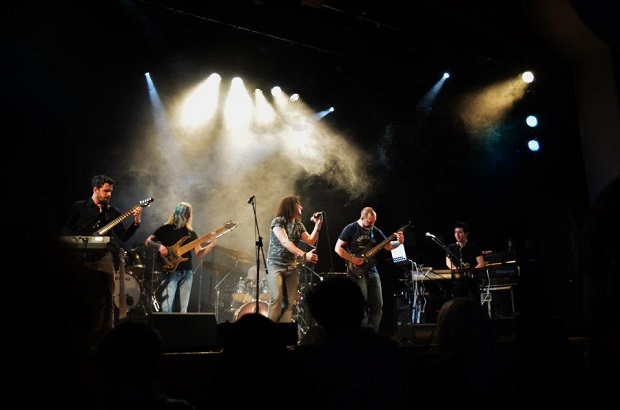 We’re fans of the 70s bands especially King Crimson, Queen, Yes and Gentle Giant as well as the more modern metal bands like Textures, Meshuggah and Periphery, so those sounds will naturally come out. We wouldn’t want to just be one thing or the other, so we walk the line somewhere in the middle. I should add that’s not really something we’ve ever discussed or even aimed for, but that’s just how it ended up. The Mountain is atmospherically darker than its predecessors, with keywords such “weird” and “eccentric” playing the leading role. Is it where you decided to change the course with this album, giving more space for experimenting? Richard: One of our aims for this album was to strip down the music and create something a little more elemental than our previous work. We used this as a rough guideline and went with the natural flow of things. When composing, we’re not too conscious of how dark, happy or quirky a song should be, but instead let what comes out, come out. To me, what we end up with is most the honest expression of our emotions and feelings. Soon after the album was released, bassist Thomas MacLean left the band and you engaged in bass auditions. We are two weeks past since the auditions are officially closed, are you satisfied with the response? Have you already selected applicants for a live London audition? What are you looking in particular? Ray: Firstly, having Tom in the band was always a massive honour for me. Before we asked him to join, his playing with To-Mera stunned us all. So, speaking as the drummer in the band, there’s a unique relationship there that’s gonna be really difficult to find with some one else. We’ve had a great response to the bass post ads and had more than 30 really strong applicants send in videos. We’ve somehow managed to filter that number down to a handful of players as there’s a variety of important factors that come into play. Most of the guys who’ve auditioned we’ve never even met before so for a start, even before we’ve heard them play, we need to be able to communicate and interact on a similar level. Whether it be socially in the tour van, or musically in the jam room; it’s the difference between getting a hired hand in or having a band ‘mate’. For me, this comes first, even before their playing ability. They’ve gotta be able to play in a variety of styles and show a real interest in those styles. So a strong technical and musical ability is a must. And an engaging stage presence and image will ensure they boost the band’s live energy and public profile which is quite important too! Falling Back to Earth was voted as the best prog epic of 2013 in our poll. We do not have any fancy prizes at the moment, but I promise I’ll buy you a beer first time we see each others [laughs]. How about that? Ross: It’s rather cool that it’s been voted as the best prog epic of 2013… We are proud of this one but we certainly weren’t expecting any prizes or accolades… However, seriously, if you’re buying I’ll have a pint of ‘London Pride’ please! Seriously now, what’s the story of Falling Back to Earth? Ross: Charlie and I penned this one and consists of 2 parts. Part 1 is largely based on the story of Icarus and deals with ambition, failure and perseverence, using the metaphor of wings and flying too close to the sun to represent how we take on challenges in life and the desire to prove something to people. In the second part we took our inspiration from science fiction iconography, looking at the who we are and the world around us when we have fallen, and the humility required to reach out to others for forgiveness & acceptance. The rise and fall of this song sits aptly as the centre-piece of this album. I’m sure many tech geeks would love to know about the gear you use live and in studio, so let us know about it. Diego: Of course they would! In the studio and live Charlie and Richard use their Axe Fx units for pretty much everything that comes out of their guitars. Ray loves to use quite a lot of exotic percussions during the recordings: Darbuka, Ocean drum, Pandero, Djembe ,etc on top of his killer kit. Live, Ray uses Mainstage to trigger the click tracks on his in-ears. I program all my sounds in Logic Pro mostly using the ES2 and the EXS24. I use tons of symphonic libraries and insert effects as well as my hardware units. For the live environment I run Mainstage on my Mac, an 88 Keys MIDI controller and a Korg Karma. We all are Logic Pro users, using the same DAW makes communicating ideas much easier. I am not sure if you knew, but this is the band’s third interview for Prog Sphere, making you somewhat privileged in our headquarters [laughs]. How do you feel about that? Diego: Absolutely honored, thanks guys! Although makes me wonder if the reason why we’ve been asked for a third interview is because we haven’t nailed it on the previous ones… Third time lucky perhaps? Uh, you’ve got me there [laughs]. What are your plans for 2014? Ross: Step one will be finding our 6th member to continue forward with writing for the next record. Before that happens though we’re looking forward to taking part at Progressive Nation at Sea 2014 and taking the Mountain back out to Europe later on in the year. Read “The Mountain” reviews HERE and HERE. Read 2011′s interviews with Haken HERE and HERE.